Today it is snowing in Colorado, but I know that in a matter of days the trees will start to pop and spring will be in full bloom with summer following closely behind. I cannot wait for warm days, sundresses, picnics, and the new bounty of fresh fruit that comes into season with the warm weather. Strawberries have always been one of my favorite summer treats, picked off the vine and popped straight into my mouth, my feet chilled by the wet soil of the garden. Summer means more hours of sunlight, and more opportunities for imbibing while basking in the sun. While I’m never one to pass up a good party, I do believe in the art of secretly hydrating whilst enjoying a delicious libation (long time followers of Gastronomista have heard me wax on about this over and over). 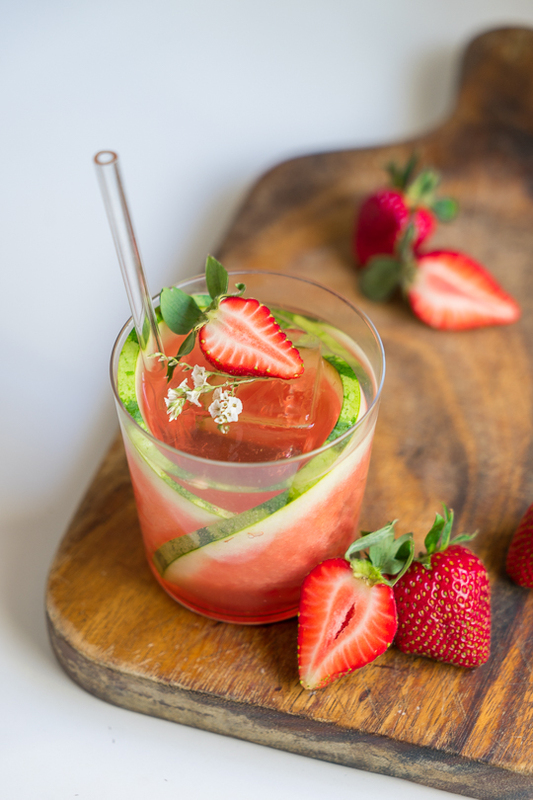 I love making spritzers in the summer, so I get an extra dose of water with my cocktail, and I love building on seasonal flavors to create complexity. 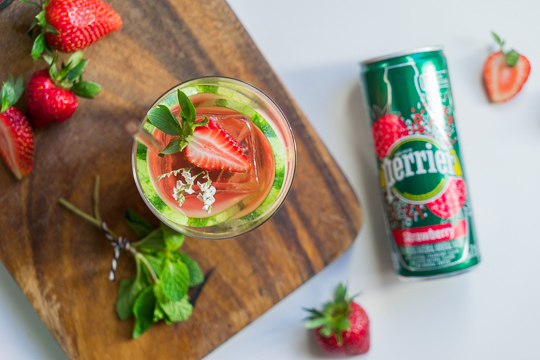 Enter Perrier Strawberry Carbonated Mineral Water, one of Perrier's flavors that tastes like fresh strawberries and is perfect for mixing. 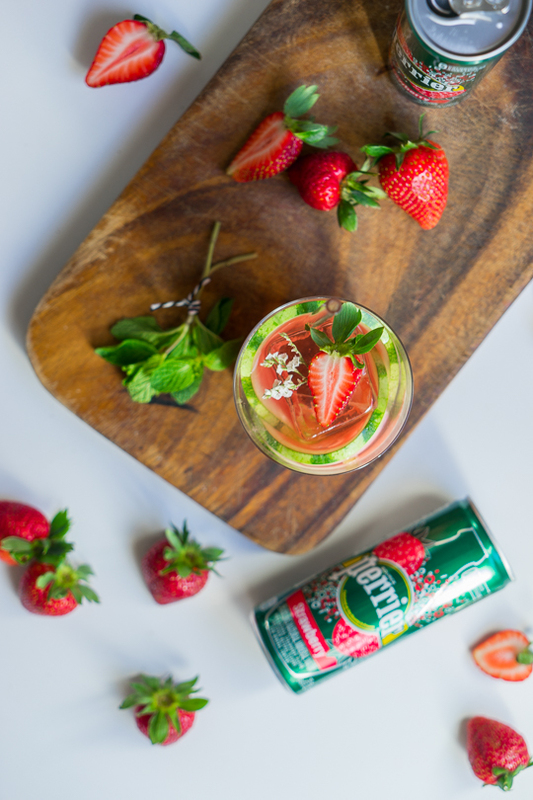 This cocktail is made with Perrier Strawberry, homemade strawberry and watermelon syrup, vodka, and garnished with fresh mint, fresh strawberries and tiny white flowers that remind me of the white strawberry blossoms that pop up every spring. Extra points for anyone who uses a real strawberry flower, they should be coming into bloom any moment now. 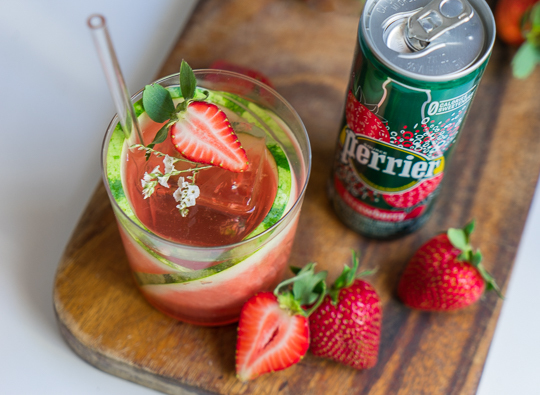 Build Perrier Strawberry, vodka, and syrup in a double rocks glass and add a large cube of ice. 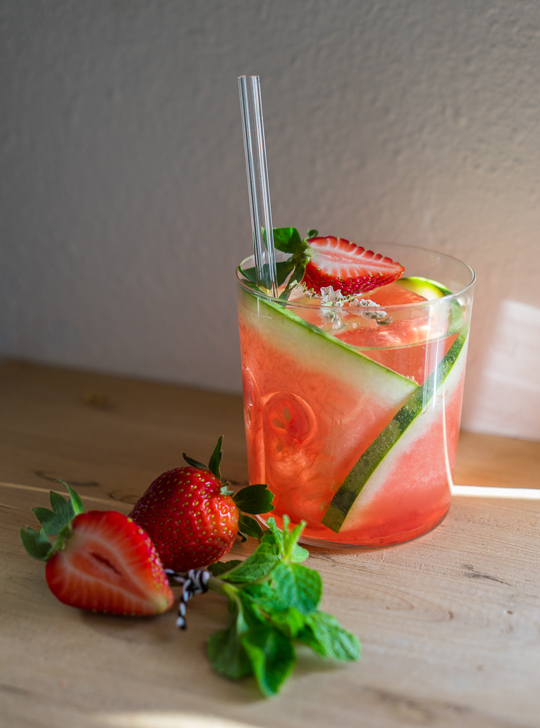 Garnish with watermelon slices, fresh mint, and half of a fresh strawberry. Over low heat, simmer water, sugar and fruit. When soft, muddle the fruit in the sugar mixture. Let simmer for 2-3 minutes and let cool. Strain into a non-reactive container and store in the refrigerator for up to a month. This is a sponsored post written by me on behalf of Perrier Sparkling Water. All opinions are 100% mine.